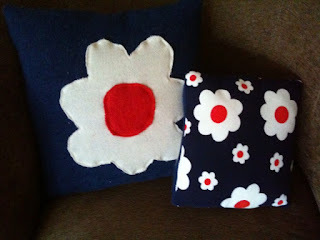 This is a pair of pillows that I made from ALL recycled (upcycled, found, etc). fabrics. I was laying in bed one night, thinking of the fabric, and I decided it would look great with one bold flower from the pattern for the front of the pillow. The best part is, I had ALL of the materials, I just had to dig them out and sew! The fabric on the back was purchased at a Salvation Army store. There was a bunch of uncut fabric, that must have come from an elderly person because there was a TON of stretch 70's polyester. Not that I have anything against 70's prints...but none of it was for me...too much lilac and olive green (ewwww). But this is a sort of nice burlap/woven feel to it, so it sewed up really nicely with the felted wool sweater I used for the front. I will definately be doing more of this, found fabric back, felted sweater front. I'll likely put zippers in from now on though, because pillows at our house tend to get spilled on.